SAN ANTONIO (AP) — The San Antonio Spurs were in a tough spot after Kawhi Leonard hurt his ankle in the second half. That’s when Danny Green and the Spurs’ supporting cast stepped up. 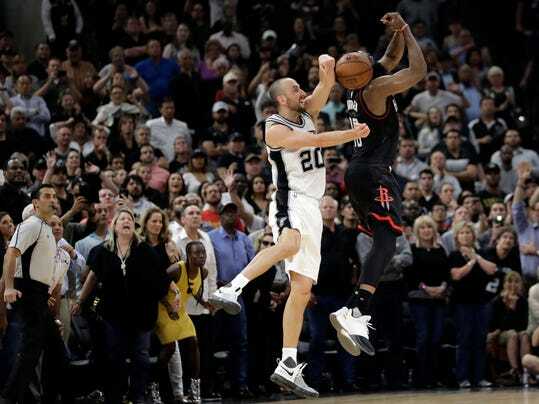 Green scored seven of his 16 points in overtime, helping San Antonio top James Harden and the Houston Rockets 110-107 on Tuesday night to take a 3-2 lead in their second-round playoff series. Harden had 33 points, 10 rebounds and 10 assists. He had a chance at a potential tying 3-pointer in the final seconds of OT, but was blocked from behind by Manu Ginobili.